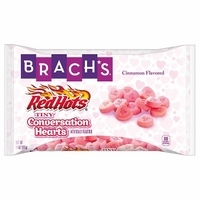 Brachs red hots conversation hearts are a new item this year. Tiny conversation hearts with a spicy cinnamon flavor. Just like regular candy hearts this also have little messages of love on them. This are perfect for anyone who likes red hots candy. They have just enough cinnamon flavoring to give them a spicy taste without being to hot. Red hots conversation hearts come in a 14 oz bag.